Salesforce1 is the unified mobile app for the Salesforce platform. It allows users to stay up to speed with everything in Salesforce right on their smartphones. As an end-to-end product designer for Sales Cloud, I designed features to help salespeople manage their relationships, accelerate their work, and close deals. One fun project I got to work on was Account News, the first feature in the app to leverage our new sales intelligence algorithms. More than anything, sales reps want information about potential customers that can help them strike up a conversation. BlueTail, our data mining team in Israel, uses web crawlers and machine learning to aggregate, organize, and rank news about companies and industries. Salesforce1 can then surface interesting articles and tweets in context on a user's phone, and quickly show related news about any customer she might be researching or interacting with that day. Salesforce1's Today page surfaces the top news based on the user's phone calendar. Account records show top news for the company, plus any relevant industry news. Over time, we continued to iterate on the card designs, and added richer content from a wider variety of sources. 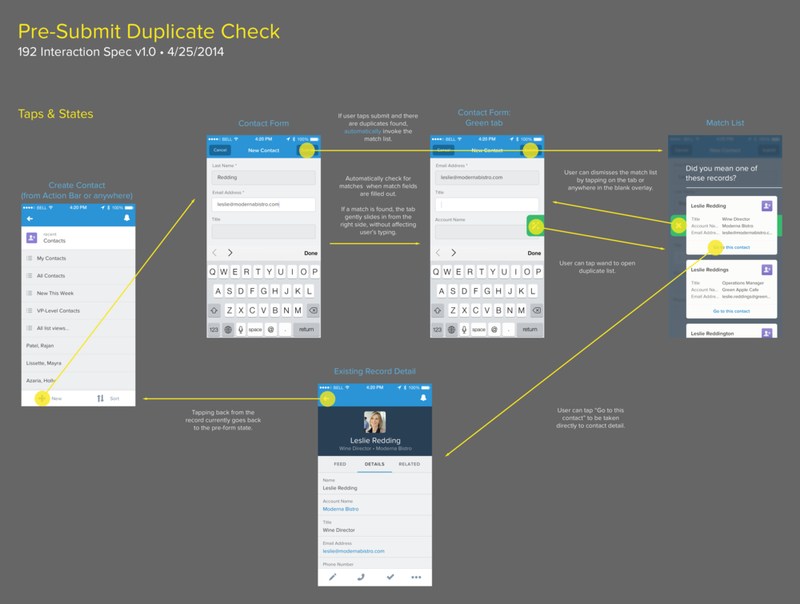 Duplicate Alerts were the 3rd most requested feature in the history of Salesforce, and turned out to be one of the most impactful projects I helped deliver. Dirty data can become a challenge as Salesforce deployments get more complex, and our customers constantly seek better tools for cleaning up duplicate records. One of the most common mobile tasks for sales users is to add new contacts to Salesforce after meeting them at customer visits, conferences, or other functions. In the past, this natural and encouraged activity would often result in the creation of duplicate records – salespeople often don't have time to search and see whether a contact already has a record in the system. With Duplicate Alerts, Salesforce administrators create highly customizable rules for data entry. Whenever users add a contact, Salesforce can check against these rules and immediately surface matching records already in the system. This has the dual benefit of 1) saving steps and time for our salespeople by bypassing new record creation whenever possible, and 2) keeping the entire Salesforce instance's data cleaner and more accurate. Salesforce1 detects when users enter existing contacts, and surfaces matches using pull tab. The app encourages users to navigate rather than create, bypassing the need for more manual data entry. Cards could expose more information about what triggered the match. In v2, the feature starts checking for duplicates as soon as the user starts typing, minimizing the amount of wasted effort. Some of my first projects at Salesforce involved social network integration into Salesforce1. I designed our mobile Twitter feature, which allows users to associate Contacts or Accounts with their Twitter handles, and surfaces Twitter feeds, profiles, and common connections. As it turned out, one of the most compelling parts of this feature was the Twitter photo association. It's usually inappropriate for a salesperson to snap a photo of a customer in person. Associating a Twitter profile photo became a quick way to match a face to a Salesforce Contact record, or to add a company logo to a Salesforce Account record. We continued a lot of design exploration around "Dossier" features that would integrate additional social information — most notably with LinkedIn. Unfortunately, many of those ideas didn't make it to production due to restrictions on our data access. A few of our many social integration designs.